Come save lives with us in New York City, the Abortion Capital of America! 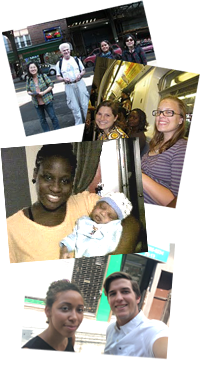 Expectant Mother Care (EMC) is New York City's oldest and largest network of pregnancy centers. Directed by Chris Slattery, EMC FrontLine counselors and ultrasound techs have helped save over 43,000+ children from abortion since 1985, and have counseled over 150,000 women. In 2018, EMC FrontLine's staff and interns saved hundreds of mothers from certain abortions mostly inside our pregnancy care centers in the Bronx, Brooklyn, Queens and in ten others US cities where we take inbound abortion-minded callers and make referrals to local centers. Learn more at the Expectant Mother Care page on Facebook. This internship involves up to 44 hours of work a week working in a variety of counseling settings in our pregnancy care centers, outdoor sidewalk counseling at abortion mills, escorting expectant mothers to appointments, pro-life/pro-abstinence literature distribution, and organizing pro-life special events. We will tailor the work to the individual talents of each person and to our needs each week. You will live in the Bronx Lifehouse with other interns and will be reimbursed for MetroCards. Interns will be given a stipend of $100 per week. Interns must raise and donate $150 towards Expectant Mother Care, or work the first two weeks for no stipend. 8 week minimum internship length. Stipend money will be paid via Google Wallet or PayPal. Though this is an intense, rewarding internship requiring lots of hard work, our interns have fun too! For example, we often go to shows, museums, sporting events, and on occasional beach trips (in the summer). Interns must be at least 20 years old, or reach age 20 during the internship. Non-native English speakers must have good or excellent English scores.